Oh my! this drink is truly heaven, Power up your pucker and get ready for this decadent peach martini. This cocktail is truly heavenly. It’s no wonder it’s a smashing hit at the Aspen Grill. The sparkling white wine in this drink lends a fizz on your tongue upon first sip. After a few more sips, the flavors melt on into your mouth creating a luscious, peachy warmth. For a refreshing and bubbly martini that reminds you of summer—this is it. In a cocktail shaker, mash or muddle 1/2 peach. 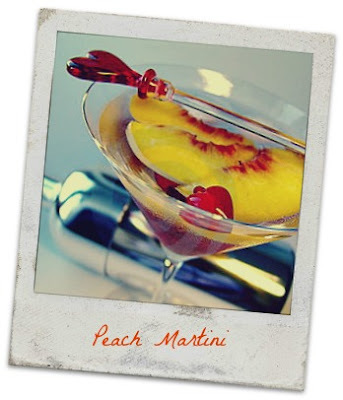 Add ice, vodka and schnapps,stir..Strain into chilled martini glass; top of with wine.garnish with peach and mint serves 1. YUM! Love peaches! Thanks so much for sharing at Tuesdays with a Twist. Nice recipe I would say. It has always been fun for me to try something new and innovative in cooking. I love cooking and whenever I get free time, I love to eat something made by me. Along with tasty dishes, I love to make wine at home. I often use Home Brew West wine making kits for preparing wine. Last time, I made chicken with red wine sauce.Now, I am going to try the recipe mentioned above for sure.